How to write an Annual Leave Letter? Download this Annual Leave Letter template now! We provide this Annual Leave Letter template, which will help you to draft the perfect one! This request letter template will save you time, cost and efforts and help you to get approval for your well-deserved annual leave! One suggestion that can help in order to get approval for your request, is that before you start to write the annual leave letter, check with colleagues, or any other stakeholders who will be affected by your absence, for their plans and see if they can help you taking care of your tasks for the time you are not available. Make sure that you also notify those who may be inconvenienced, like partners or customers. When you write the annual leave request, be clear about what you are asking for at the beginning of the letter, including being specific in the subject line. If you will be taking hours that you have already accumulated and are due to you, state that. Briefly describe the steps you have taken to notify co-workers or clients. Depending on your job description and level of responsibility, you may want to state where you will be, whether or not you will be checking phone, WhatsApp, WeChat, or email regularly, and how you can be reached in case of work emergencies. This Annual Leave Letter has ways to grab your reader’s attention. The letter is drafted by HR professionals, is intelligently structured and easy-to-navigate through. 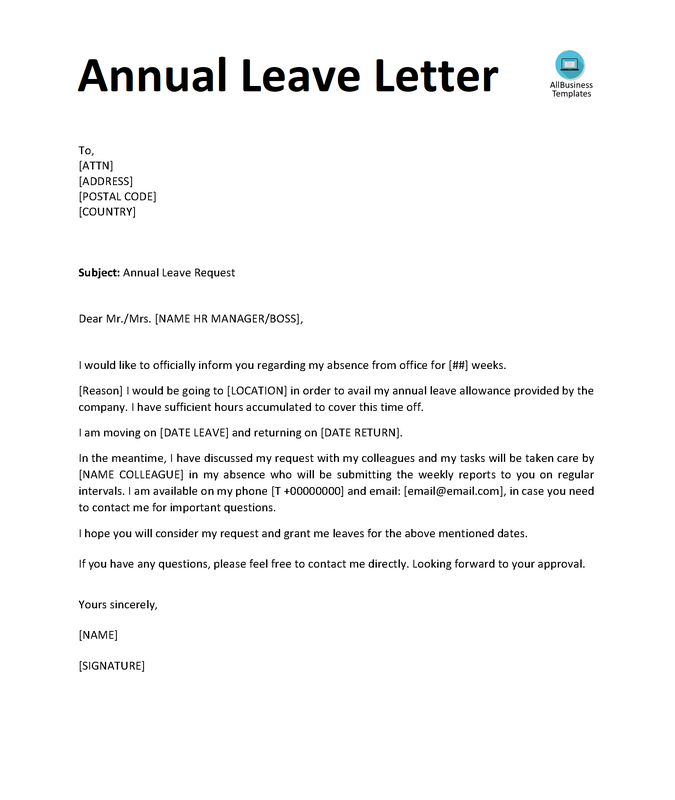 If this annual leave letter template is not the right one for you, then please have a look in our collection of leave letter templates and find the right letter template that fit your needs. Download this Human Resources Annual Leave Letter template now! Snippet: I would like to officially inform you regarding my absence from office for [##] weeks. [Reason] I would be going to [LOCATION] in order to avail my annual leave allowance provided by the company. I have sufficient hours accumulated to cover this time off. I am moving on [DATE LEAVE] and returning on [DATE RETURN].